A small garden can save you a bundle at the grocery store: an average plot provides “an estimated 300 pounds of fresh produce worth $600,” according to a study by the National Gardening Association (NGA). That estimate is based on an average gardener’s investment of $70, so $530 is a pretty impressive return! Blogger Kristina Seleshanko estimates her 12-by-14-foot and 33-by-3-foot gardens significantly cut her grocery bills during the summer of 2013. Her startup costs (including raising backyard chickens) were just $278, yet she calculates her harvest of eggs, tomatoes, kale, onions and potatoes would have cost her approximately $1,770.89 at the grocery store, equaling a savings of $1,492.89. With returns like these, Penny Hoarders willing to get their hands dirty should take notice. It turns out, says the NGA, one of the top reasons to grow your own food in a vegetable garden is to save money on grocery bills. Here’s how to make the most of your garden to cut your grocery bills. If you have the time and space, start seeds indoors in the late spring to save even more. “Seeds are still a great deal. Since you usually get more than you can use, why not set up a seed exchange with your gardening friends,” says About.com gardening expert Marie Iannotti. During a recent trip to the grocery store, I found tomatoes on the vine were $2.29 a pound, while a six-pack of tomato plants that will yield up to 15 to 25 pounds per plant at your local garden center in the spring is typically under $5, and a pack of seeds costs even less. The savings of starting your plants from seeds make that spaghetti dinner even more affordable. Your garden doesn’t have to be huge to make an impact on your bottom line. The NGA found that while the average garden in the U.S. is 600 square feet, many are much smaller. Maximize the space you have available by planting high-yield crops like tomatoes, onions and leaf lettuce. Less efficient crops include Brussel sprouts, celery and pumpkins — though that doesn’t mean you have to skip these entirely. Don’t underestimate your vertical space. “Use whatever you have to allow climbing plants to grow up and save precious garden space,” suggests Bodrie. Planning is essential when gardening to save money. “Take careful notes,” says Haskell. “I keep sheets about when I planted things, what does well, what doesn’t, and how much of a harvest I get. All that helps me decide what and how much to plant the following year.” For help planning your garden, check out this great chart from the NGA showing yield, dollars per pound and value. “A shrewd gardener always plans to grow more vegetables than can be eaten fresh. The surplus can be preserved in a variety of ways for consumption during the winter months,” suggest staffers at the Center for Agriculture, Food and the Environment at UMass Amherst. Crops like carrots, potatoes, onions, winter squash and pumpkins require little to no processing for long-term storage. Both Haskell and Bodrie chop, blanch and freeze extra vegetables. A small chest freezer is a worthwhile investment if you are looking to enjoy farm fresh veggies all year long. You can start saving by growing herbs or pot-friendly veggies like tomatoes, cucumbers or lettuce on a small patio or sunny window. Your state’s cooperative extension or master gardeners program typically offers great (and free!) advice for gardeners of all levels. 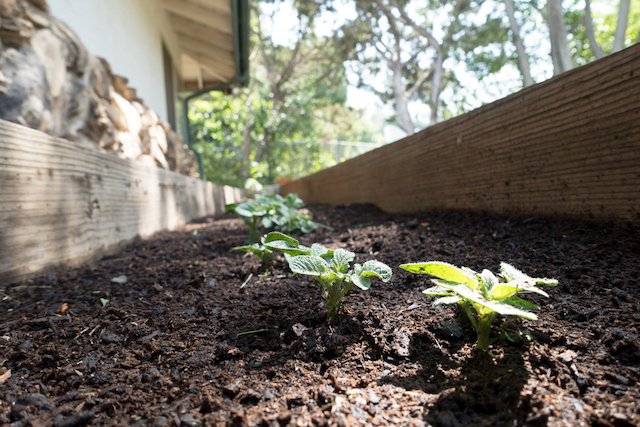 Your Turn: Do you keep a garden to grow your own food? What’s your best tip for new gardeners? Ally Piper is a writer, designer and marketing director living on Cape Cod. She used to have a garden where she grew mammoth zucchini and is anxious to get her hands dirty again soon.